Welcome back to another edition of Channel Chaser! 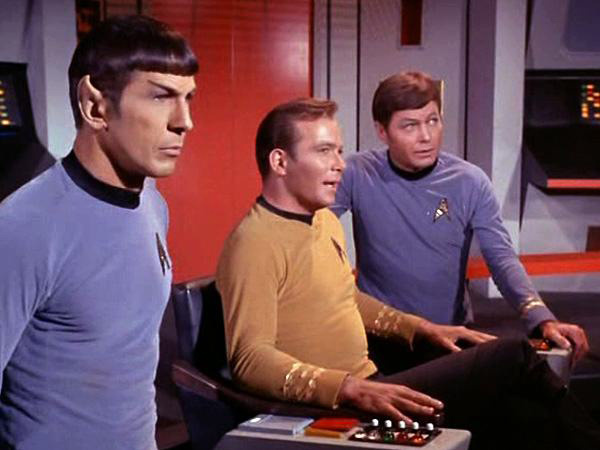 I’ve recently been taking a trip in the way, way, way back machine of Netflix to enjoy the 60’s-era sci-fi classic Star Trek (that’s the Original Series for you uninitiated). 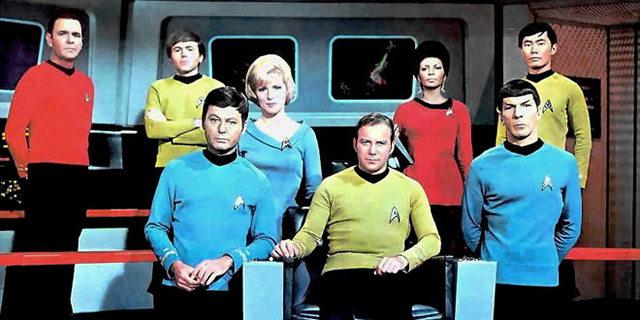 I’ve said it before and I’ll say it again: in spite of the cheesy special effects and sometimes wooden acting, Star Trek still stands as one of the most influential and famous TV shows of all time for a lot of reasons, but primarily because of the resounding moral lessons the 23rd century characters have to teach us back in the present. Watching Star Trek when I was a little kid was one of my most formative influences in terms of my entertainment choices, and I’ve always felt that it taught me a lot about life in the process of just being plain fun. And so, listed here for your reading pleasure, are a few of what I think are the strongest points the series makes as a whole. 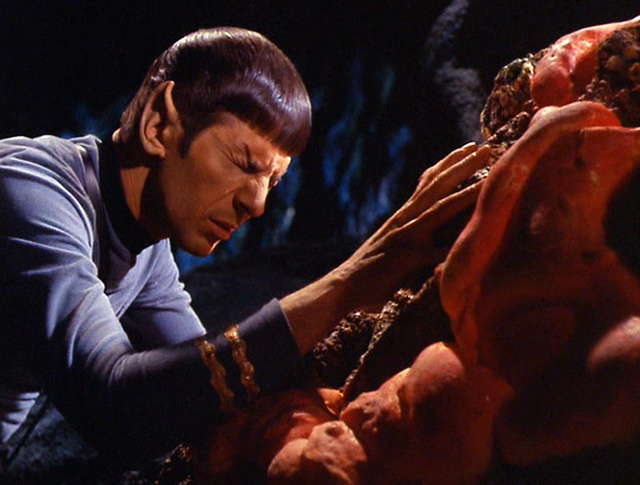 The idea that things aren’t always what they appear and that people shouldn’t rush to judgment has so many precedents in Star Trek that I could hardly list them all, but my favorite one is the Horta of Janus VI. Human miners and Kirk’s crew hunted down this grotesque and rocky slug-like creature so that they could destroy it after it killed several people. But in the end, it turns out that the Horta is an extraordinarily intelligent and sensitive creature that was only driven to murder because of the miners’ unwitting slaughter of thousands of her young. With some timely mind melding by Mr. Spock, Kirk and the Horta manage to reach an understanding and agreement that benefits everyone in the end. It just goes to show that no matter what the situation, appearance isn’t everything. The characters of Star Trek are frequently put into dangerous and life-threatening situations, but one thing that never fails is Captain Kirk’s ability to laugh at himself and his mistakes once it’s all over. Hardly an episode ends without Kirk cracking a joke at somebody (usually Spock) to lighten the mood. Kirk’s unfailing ability to find the enjoyment in every situation he faced was something I always admired about him, and the few times when he does get too stuck in the mud for his own good, he always gets set straight once he recognizes the ludicrous nature of the situation (see “The Trouble with Tribbles”). It’s our job to take whatever life throws our way and make the best out of it that we can. In the episode “This Side of Paradise”, Kirk and the crew discover a planet where colonists live a seemingly idyllic existence thanks to alien spores that allow them to let go of their cares and concerns and just enjoy life. While this sounds great in theory, the flip side of it is that the colonists haven’t made any progress toward their mission since coming to the planet, which was originally intended to help all of humanity. As Kirk wisely notes at the end of the episode, perhaps paradise isn’t where humanity thrives: maybe we’re meant to struggle and better ourselves by overcoming the challenges and problems we face in everyday life. If we lived in a perfect world and didn’t have anything to strive toward, we wouldn’t really be human at all. One of the constant highlights of Star Trek is the constant debate between Kirk, Spock, and McCoy about emotion versus logic. 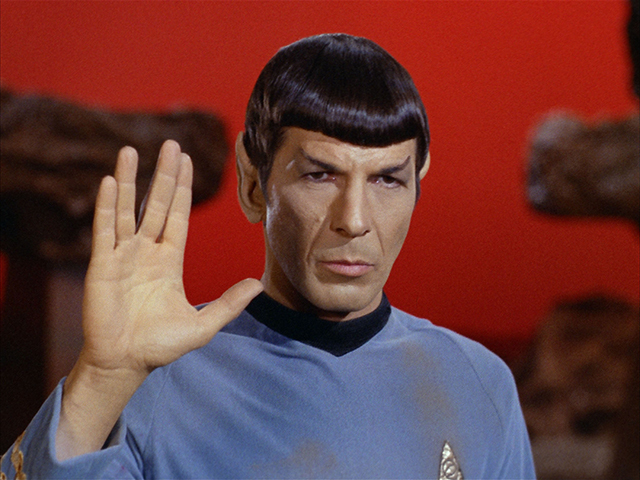 Kirk and McCoy often malign Spock’s seemingly unfeeling and cold deductions, but more than once Spock’s ability to act without the clouds of doubt, anger, guilt, or any other human emotions saved them and the rest of the crew where an ordinary man would have been paralyzed by indecision. But on the other hand, Spock’s human friends are able to offer innovative solutions to problems the Vulcan was unable to think of by himself. The moral of the story is that there’s no one point of view that will get things done or that is completely and always correct. In “The Enemy Within”, a transporter accident splits Kirk into two copies of himself: one ostensibly good, and the other evil. While it’s clear the “evil” Kirk is full of unrestrained aggression, desire, and many negative emotions, it also becomes apparent that without these feelings, the “good” version of Kirk is weak, indecisive, and unable to function as a commander. In the end, only by reuniting themselves can the two halves make a full human being again. The lesson here is that while there may be many things we don’t like about ourselves, it’s never possible to tell when one of these traits could help us, or how it’s shaped who we are. We wouldn’t be ourselves without all of them. While they may bicker and argue much of the time over their differing points of view when tensions get high, it’s clear that Kirk, Spock, and McCoy, along with the rest of the crew of the Enterprise, are close enough to be called a family in many respects. In many situations where one of them has been in danger, such as Scotty being accused of murder, Kirk court-martialled for offing a personal enemy, or Spock disobeying orders to help a former commander, the other crewmembers never fail to leap to their defense in any way they can. It’s clear that these people would do anything for each other, and that they’ve always got each other’s back, and that’s more important than anything in this or any other universe. More than once, when the crew of the Enterprise is faced with a crisis, the tendency of some of the human characters, Kirk included, is to immediately attempt a military solution, and often this is shown to have catastrophic results. Overall, the characters of Star Trek manage to talk their way out of a lot more situations than they do by fighting their way out. Compromise and understanding is always the goal, and senseless violence is always condemned, even when it’s only simulated by a computer (see “A Taste of Armageddon”). It’s made clear in this show that violence only leads to more violence. Compassion and mercy for one’s enemies, as well as anyone else, is key to accomplishing any mission. As the commander of a starship crewed by over 300 other people, it’s often made clear just how much pressure Kirk is under as a captain day in and day out. It’s his responsibility to ensure the safety of all these other lives, and take the well being of every single person under his supervision into account when making any decision. He’s also stated more than once that a captain is by proxy responsible for the actions of everyone under their command. While this seems like a bit of an unfair burden for a person to place on themselves, the fact that Kirk commands the strength and firepower of this many people and a ship like the Enterprise means he has to make responsible choices about how and when to use them. It’s the same for anyone in life who has some measure of power, and it’s up to them to utilize it for the benefit of others. This is a tried and true Spock-ism that can sound a bit odd at first. Doesn’t that just advocate for tyranny of the majority and denying a voice to the individual? But that’s not what the real meaning is here. What this saying really is about is the demonstrated willingness of Kirk, Spock, or just about anyone else on the Enterprise to sacrifice themselves, or put themselves in harm’s way, in order to save each other and the ship at large. 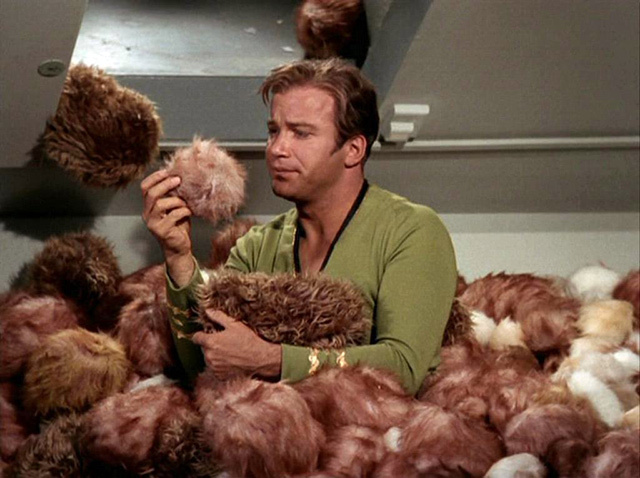 The selflessness of the characters on Star Trek is something we could all take a lesson from: always consider the consequences of your actions, and make sure that you’re not just doing things for yourself, but for the benefit of others. Its utilitarianism at it’s finest, something I think we could do with a little more of in real life. This is the most famous tag line in Star Trek for a reason, you know. The entire show is basically a giant metaphor for how humanity in general approaches the unknown. We can approach it with fear and trepidation, or we can embrace it and enjoy the wonder of discovery. Blaze new trails. Don’t get stuck in conventional thinking. Don’t be afraid to take some risks. And most importantly, always believe in a positive outcome. If there’s one thing I learned from James T. Kirk, it’s to never, ever give up, and that there’s no such thing as a no-win scenario. All you have to have is the tenacity, patience, and courage to look in the right place.